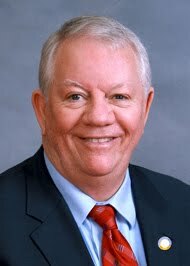 NC House member Bill Owens gives new meaning to the phrase "destructively befuddled." 2. A few minutes before that he had said in debate that he would vote to sustain the governor's veto, yessiree-Bob. Befuddlement? Wrong word, probably, as it appears much more calculating, since Mr. Owens apparently (and quite obviously) changed his vote on the veto because four Republicans are absent today, and Speaker Thom Tillis had to call in his chit. This prize of a Democratic legislator announced on June 3rd that he would not be running for reelection, so perhaps he feels perfectly free to make a perfect spectacle of his so-called "principles." The corporate take-over of the state continues apace, but then we didn't need no stinking clear air & water! We are in the top ten states for polluted air now. One sure thing we can say with the Republicans in charge in Raleigh, we sure ain't going to breathe better. This guy's probably a holdover dixiecrat. Good riddance.